Two partial skeletons of a new dinosaur were discovered by private collectors, including Mike Triebold and the Nuss family, in South Dakota, and later acquired by the Carnegie Museum of Natural History in Pittsburgh. A third partial skeleton was recovered by a team led by Tyler Lyson, now a postdoctoral fellow at the Smithsonian’s National Museum of Natural History, in North Dakota. Hans-Dieter Sues, curator of vertebrate paleontology in the Department of Paleobiology at the National Museum of Natural History, and Lyson collaborated with lead author Matthew Lamanna, assistant curator of vertebrate paleontology at the Carnegie Museum of Natural History and Emma Schachner, a postdoctoral researcher at the University of Utah in Salt Lake City, to describe the new species: Anzu wyliei. Where was A. wyliei discovered? The three described fossil skeletons of Anzu were unearthed from roughly 66 million-year-old rocks of the Hell Creek Formation in North and South Dakota, a geologic site celebrated for its abundant fossils of famous dinosaurs such as Tyrannosaurus rex and Triceratops. One specimen was recovered near Marmath, N.D., and two others were found in Harding County, S.D. When did A. wyliei roam the Earth? Anzu lived during the Cretaceous period from about 68 to 66 million years before present, at the same time as the T. rex and Triceratops. What did A. wyliei look like? A. wyliei was roughly 11 feet long and 5 feet tall at the hip. Except for its long tail, it resembled a large flightless bird, with feathers on its arms and tail, a toothless beak and a tall crest on top of its skull. The neck and hind legs were long and slender, similar to those of an ostrich. Unlike in birds, the forelimbs of A. wyliei were tipped with large, sharp claws. Why is the discovery of A. wyliei scientifically significant? The fossils of Anzu provide, for the first time, a detailed picture of the anatomy, biology and evolutionary relationships of North American oviraptorosaurs, which were first discovered from incomplete fossils nearly a century ago. A. wyliei offers clues about the evolutionary relationships between its family, the Caenagnathidae (pronounced SEE-nuh-NAY-thih-DAY), and the Asian Oviraptoridae. 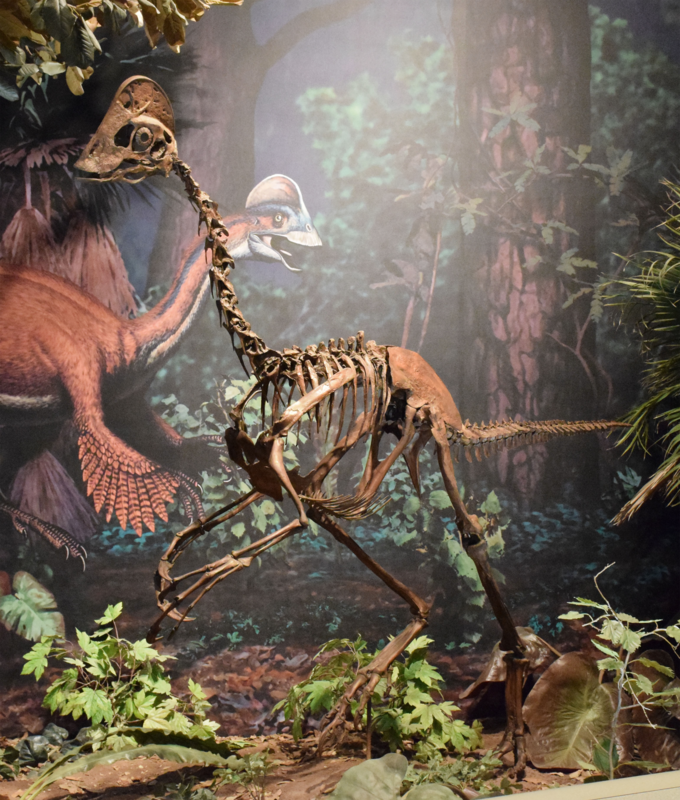 The occurrence of oviraptorosaurs in both Asia and North America came to no surprise to the researchers, because the two continents were connected during the Cretaceous Period, which facilitated dispersal of dinosaurs and other animals between them. However, the research team revealed that North American oviraptorosaurs were more closely related to each other than they were to most of their Asian cousins. Analyses of the Anzu skeletons confirmed that caenagnathids were amazingly diverse and included species that were as small as turkeys and as large as A. wyliei. The research team also confirmed previous suggestions that Gigantoraptor, the largest known oviraptorosaur at 1.5 tons, is an Asian member of Caenagnathidae. What did A. wyliei eat? Although the preferred food of A. wyliei remains a mystery, the structure of its skull suggests that Anzu was an omnivore and could to subsist on either meat or plants. What kind of habitat did A. wyliei prefer? The three Anzu skeletons were found in deposits of humid floodplain environments, suggesting that the new species favored such habitats. 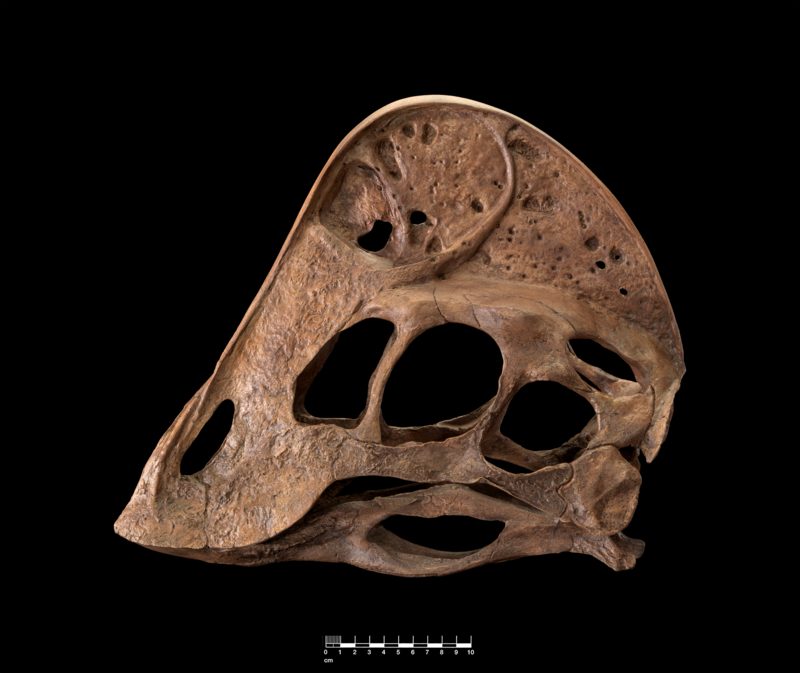 This is one way in which caenagnathids appear to have differed greatly from their Asian oviraptorid cousins, which are found in rocks deposited under arid to semi-arid conditions. How did A. wyliei get its name? The species’ genus name was given after Anzu, a feathered monster in ancient Mesopotamian mythology. The species name, wyliei, was given in honor of the dinosaur-loving grandson of two of the Carnegie Museum’s supporters. 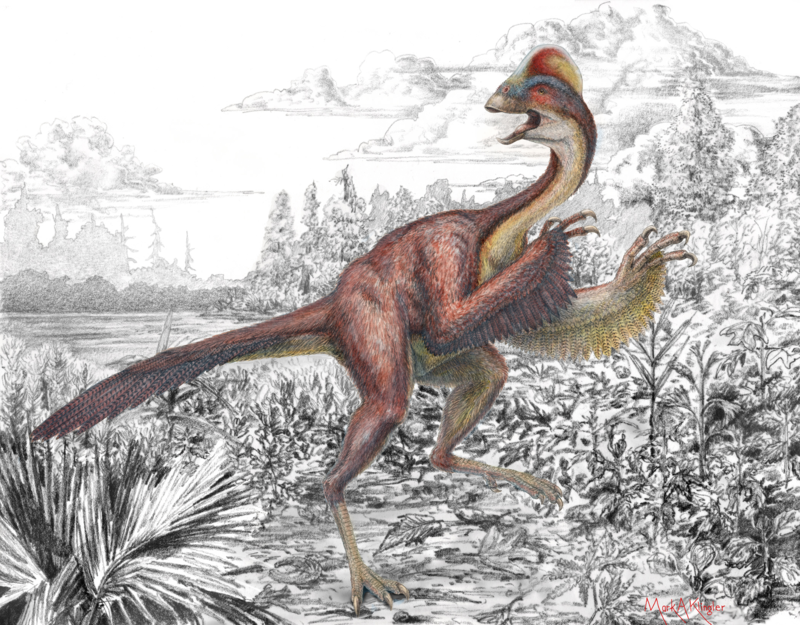 The dinosaur’s bird-like anatomy prompted scientists to nickname it “The Chicken from Hell” after the rock formation in which it was found. Do the fossil skeletons of A. wyliei show any evidence of injuries? Two of the Anzu specimens show clear evidence of injuries. One specimen has a broken and healed rib, while the other has an arthritic toe bone. The causes of these injuries remain a mystery. Where are the fossil skeletons of A. wyliei currently housed? Two of the skeletons of fossils are currently housed at the Carnegie Museum of Natural History and the third is housed at the Marmath Research Foundation in Marmath, S.D. 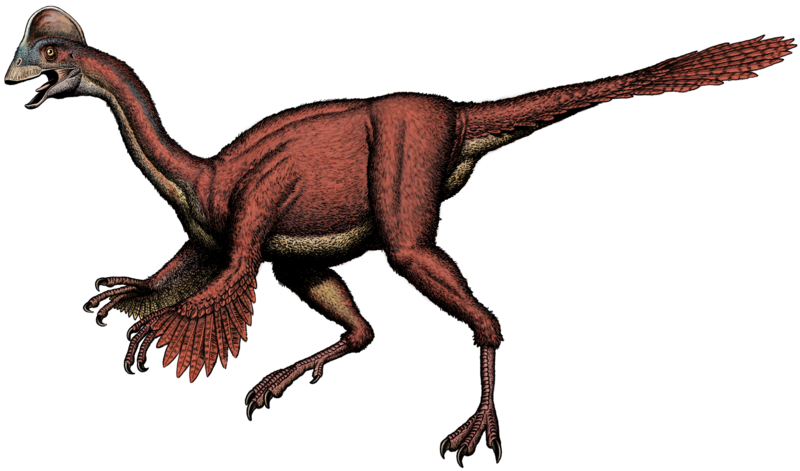 An illustration of Anzu wyliei shows several striking anatomical features of the large, feathered dinosaur, including its long tail, feathered arms, toothless beak and a tall crest on the top of its skull. 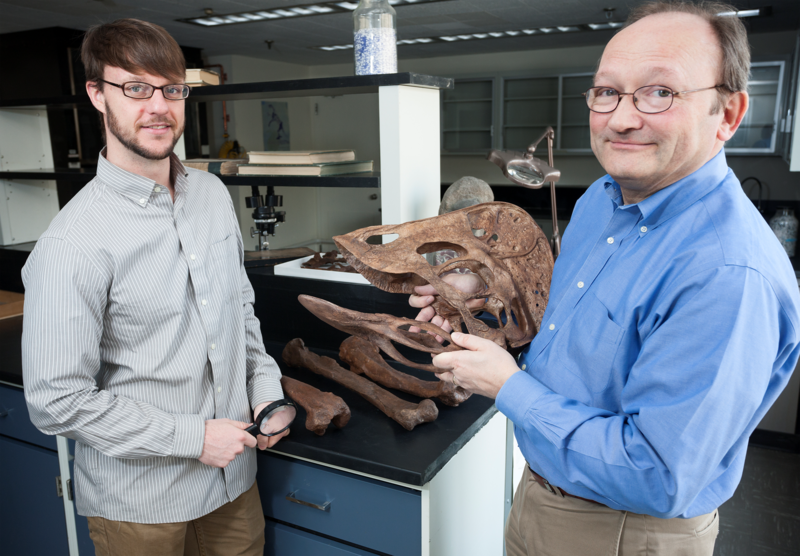 Smithsonian scientists, (from left) Tyler Lyson and Hans-Dieter Sues, examine a reconstructed Anzu wyliei skull. This reconstruction shows the skull of Anzu wyliei, including its large toothless beak, which suggests that the species may have been omnivorous. An illustration of Anzu wyliei shows its long, slender ostrich-like neck and hind legs; unlike an ostrich, A. wyliei also had forelimbs that were tipped with large, sharp claws. 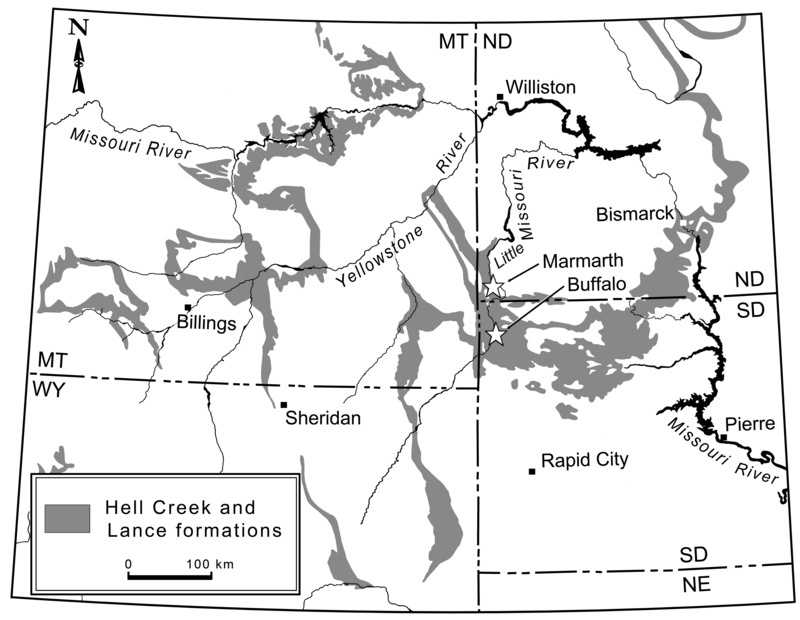 The infographic above shows sites in North and South Dakota where three Anzu wyliei fossils were discovered.